One in 20 pregnancies will result in preeclampsia. 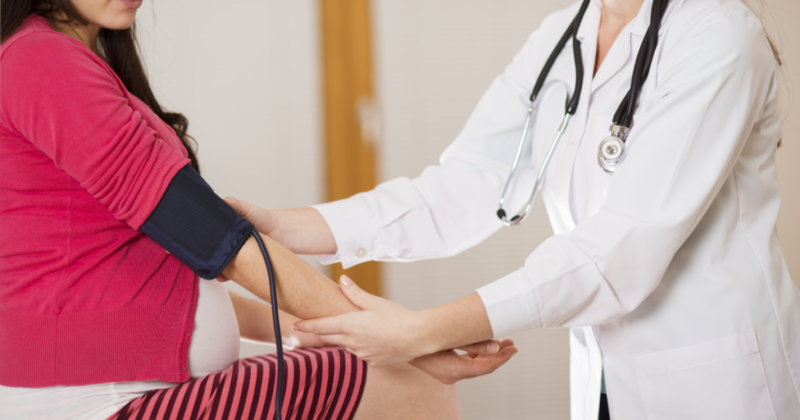 What exactly is preeclampsia and how does it impact blood pressure? We spoke with Mary Cascio, MSN, RNC, about preeclampsia, and what it means before, during and after pregnancy, and what symptoms you should look for. Preeclampsia (sometimes referred to as toxemia) is a disorder women can experience during pregnancy that is characterized by high blood pressure and often a significant amount of protein in the urine. Some researchers suspect poor nutrition or high body fat can be potential risk factors, and even insufficient blood flow to the uterus. A common misconception about preeclampsia is that it can be cured after birth, however, preeclampsia can occur even after delivery of the baby – known as postpartum preeclampsia. Cascio says that preeclampsia usually occurs with your first pregnancy and suggests getting prenatal care and follow up with your provider if you’re not feeling well. Preeclampsia can affect the baby by restricting the baby’s growth. Essentially, the baby is not getting sufficient blood from the placenta. Since the placenta is the fetus’s only source of nourishment, this can cause intrauterine growth restriction. Visit your primary care provider 3-6 months after birth, in addition to your birth-related follow-up visits, to check your overall physical health and discuss any complications you might have experienced during pregnancy. Get a copy of your pregnancy and postdelivery medical records to share with your providers for the rest of your life. Breastfeed as long as possible – women whose total lifetime breastfeeding is 6-12 months were 10 percent less likely to develop heart disease (and it’s good for the baby too). Mary Cascio, MSN, RNC, is the Manager of Labor and Delivery at Mission Hospital.